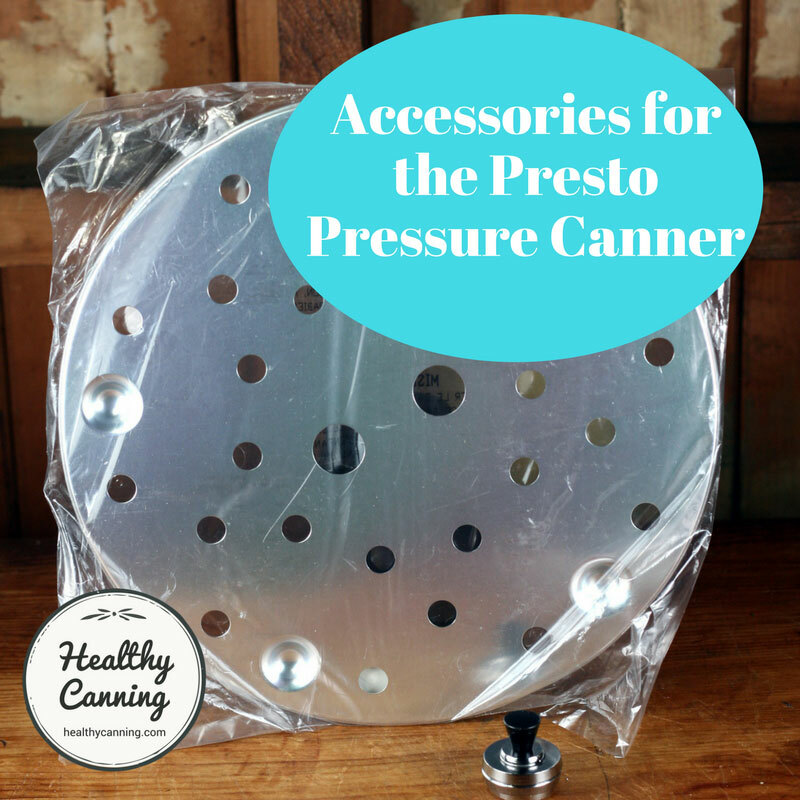 The Presto Pressure canners are one of the big three brands of pressure canners. Presto has been making and selling home canners since at least 1915. They sell replacement parts for machines from way back, so they don’t leave their older models unsupported. The company appears to be very dedicated to and knowledgeable about this field. 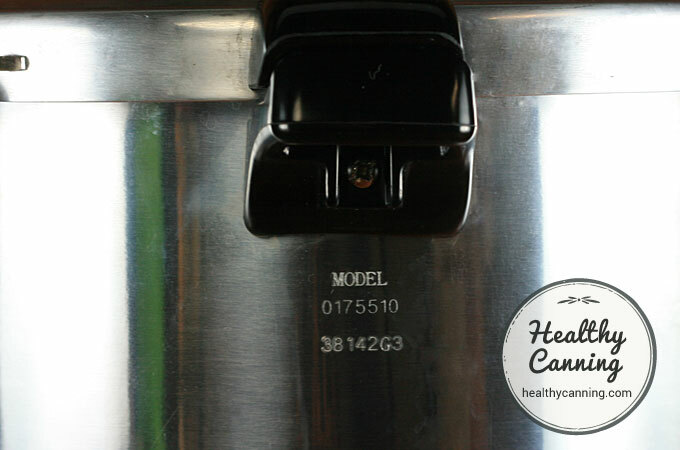 Presto is currently the only pressure canner currently being made as of 2015 (a) that is widely accepted by canning authorities and (b) that its manufacturer says is safe for glass-top stoves. By “safe” what is meant is: will not damage the stove top, either through heat, or weight. Presto’s website says of its 16 and 23 quart canners, “Constructed of extra-strong aluminum and suitable for use on regular and smooth-top ranges….” Presto site. Accessed August 2017 at https://www.gopresto.com/products/products.php?stock=01781. 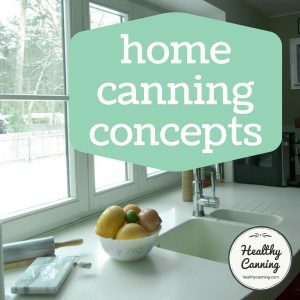 Those canners’ manuals say, “If canning on an electric smoothtop range, clean the stovetop with a cooktop polishing cream, according to the stovetop manufacturer’s instructions, before and after canner use. 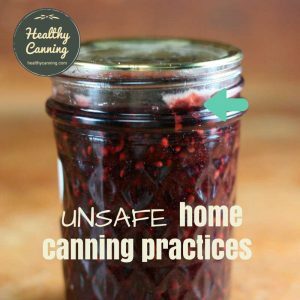 In addition, to avoid scratching smoothtop ranges, check the bottom of the canner to be sure it is clean and free of debris and does not have any nicks or scratches.” Prest0 23 Quart canner manual. Page 5. That being said, in the interest of thoroughness, Fagor’s pressure canner is also safe to operate on glass stove tops. 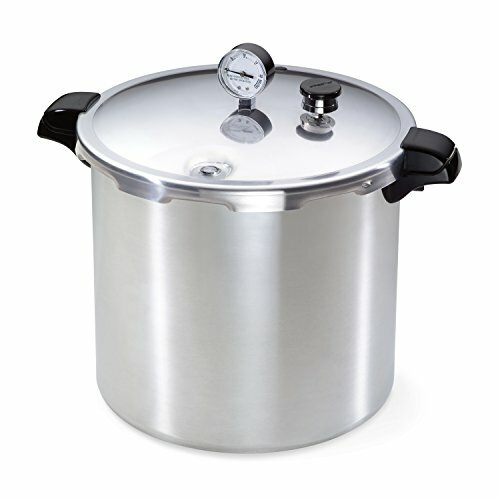 However, owing to the factors such as the way its pressure is controlled, and that the recommended processing times they give for foods under their pressure settings vary quite markedly from the norm, it’s generally not included on lists of recommended pressure canners. So for reasons such as those, Presto is generally offered up as pretty much the only line of models to choose from for a smooth stove top. 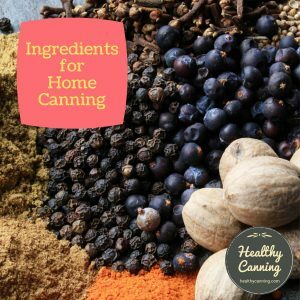 Presto does, however, still offer up the standard proviso for any pots on smooth-top stoves: do not drag the canners across the stovetop or scratching may occur. As of 2019 Presto currently has in production two models of pressure canners: a 16 US quart (litre) and 23 US quart (litre). Both are dial-gauge  “Presently Presto makes only dial gauge canners, although they made good quality weighted gauge canners in the past.” In: Bernardin FAQ. Accessed March 2015 at https://www.bernardin.ca/pages/faq/33.php#50 , and both are made of aluminum. The lids, handles, gauges, weights, shape of the bottom, stove surface contact area, and diameters of the two are identical; it’s just the height that is different. Both are certified by Presto as being safe for glass top stoves. The price difference between the two is confusingly very little, only around 10 to 20 dollars depending upon where you buy it, showing it appears that most of the value is in the lid and accessories, rather than the simple “chassis” of the actual pot. 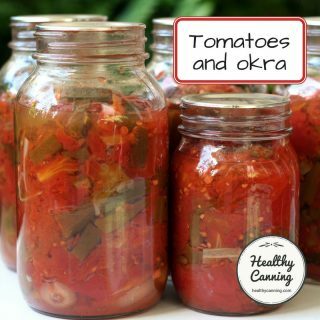 Water bath canning: The 16 quart cannot be used for water-bathing US quart / litre jars, it is not tall enough for that. The Presto manual says, “Do not use the boiling water method with quart jars.” The jars will fit in, but there isn’t enough height room at the top of the pot after that to allow for bubbling water. It is fine for water bathing pint and 1/2 pint (1/2 and 1/4 litre) jars. Please note we are not officially endorsing any stacking that Presto does not. Presto doesn’t mention any stacking for this 16-quart model in the manual. It might seem as though the model would hold 2 layers of 250 ml tall regular-mouth jelly jars but it won’t; the lid won’t quite close when the jar rings are in place. Here is Presto’s load table for the 23-quart. The first two rows of the table represent the canner when double-stocked with half-pints and pints. 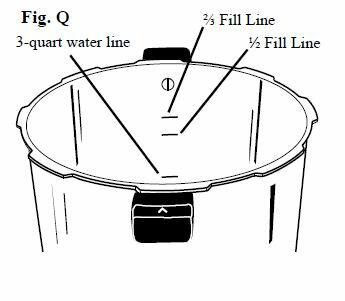 For water bath canning, the 23 quart is ideal for water-bathing US quart / 1 litre jars; it is more tall enough for that. 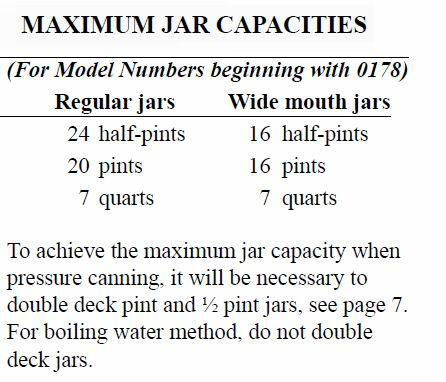 Double-decking wide mouth 1/2 litre (US pint) jars. In the 23-US quart Presto, you can fit 8 on the bottom, 8 on the top, for a total of 16 jars. 1 layer of flat, wide-mouth 250 ml salmon jars (8 jars) and 1 layer of 250 ml tall regular-mouth jelly jars (13 jars). You can’t double-deck a layer of quart (litre) jars and then a layer of pint (1/2 litre) jars on top of that. The pot is almost but not quite tall enough for that. Healthycanning.com was curious about the prohibition on double-decking jars for water bath canning so we filled the 23-quart canner up with two layers of regular pint (1/2 litre) jars, and then with water to an inch (2 1/2 cm) above the jars, and one reason became clear: the pot would just not be quite tall enough to allow the water to boil without boiling out over the stove. 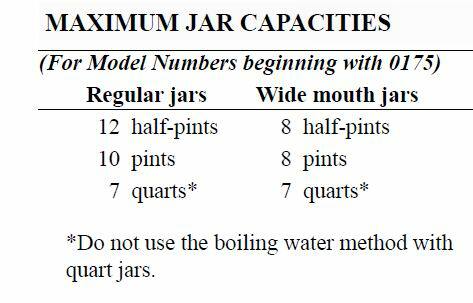 There may also be a weight consideration for glass-top stoves, which might be why the prohibition appears to apply to 1/2 pint (1/4 litre) jars as well. 2 layers of 250 ml tall regular-mouth jelly jars (26 jars) plus 1 layer of flat, wide-mouth 250 ml salmon jars (8 jars). 34 jars in total. Note: while the USDA has tested double-decking for water bathing and pressure canning, they have not tested triple decking. The concern, apparently is not one of heat distribution, but rather a mechanical one: would a third layer put too much weight on the bottom layer, pressing the canning rings down and preventing proper venting during processing, [and thus preventing a vacuum seal.] Linda Ziedrich re discussion with Utah State Extension. Email on file. 20 May 2016. It would certainly be mildly annoying to have a whole layer of jars that did not seal. It would take research-based study by the National Center or a reputable private-sector partner such as Ball, Bernardin or Presto to make a recommendation one way or the other on triple decking. Until that happens, those who are doing it informally will want to make absolutely certain they are staggering the jars as much as possible to distribute the weight. 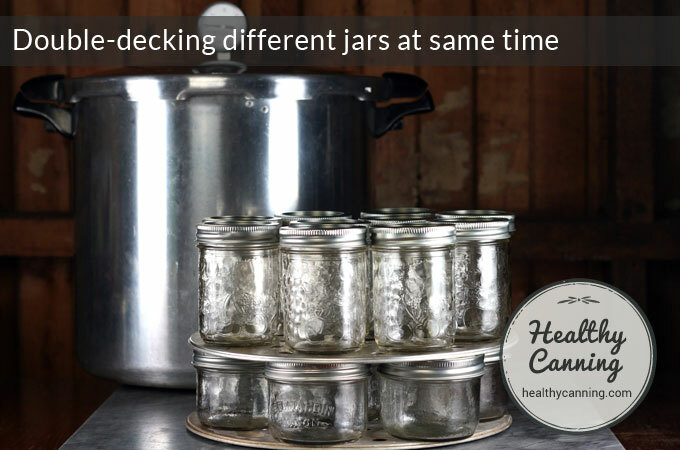 the 16 quart can’t stack for a third layer of jars while the 23 quart unofficially can. The 16 quart does have a solid advantage of its own, though: it’s lighter on its feet energy-wise because of its smaller capacity. That means, it comes up to pressure far faster, and costs less in cooking fuel to keep it at pressure. It also cools down a bit faster. So, it’s a much better choice for smaller loads. It can feel like such a waste to fire up the 23 quart for 6 pint jars. With the 16 quart, not so much. Shorter people, and older people, point out that getting enough “heft” going for the tall 23 quart on top a stove to lift or move it off a burner at the end of processing time can be an issue physically. That being said, even though the contemporary Presto models are much lighter than the older ones, and therefore a bit easier to move about, most people advise to not even try lifting or moving either size of the canner when it is full of jars and water. The 23 quart can take up to 45 minutes to come up to pressure, when full, depending. Finally the retail prices charged for the two Presto models range wildly. Even on Amazon you will find different sellers selling the same model for wildly different prices. So shop around — paying more for your Presto doesn’t make it any better; it’s still the same canner. 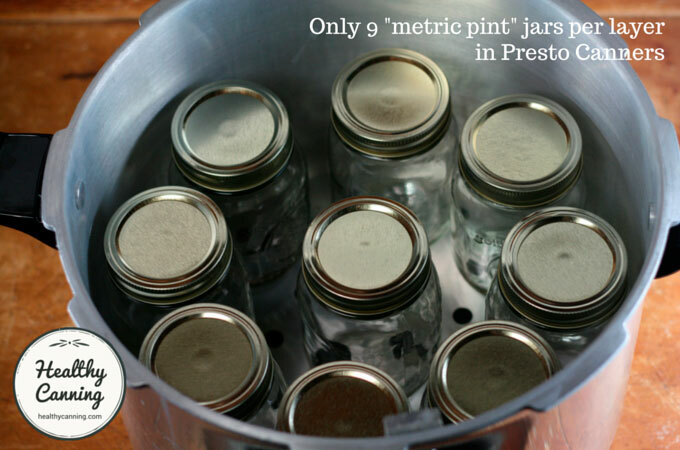 When Presto says it will hold 10 regular-mouth pint jars per layer, it means US pints. Jarden has now switched two of its brands — Bernardin and Golden Harvest — to metric sizing. As a result, the size of the regular mouth ‘pint’ jar has now increased from the old US pint (473 ml) to metric ( 500 ml / i.e. 1/2 litre). That’s about two tablespoons larger. That makes the size of these new ‘metric pint’ jars a bit larger as well. Just enough, so that 10 no longer fit per layer. 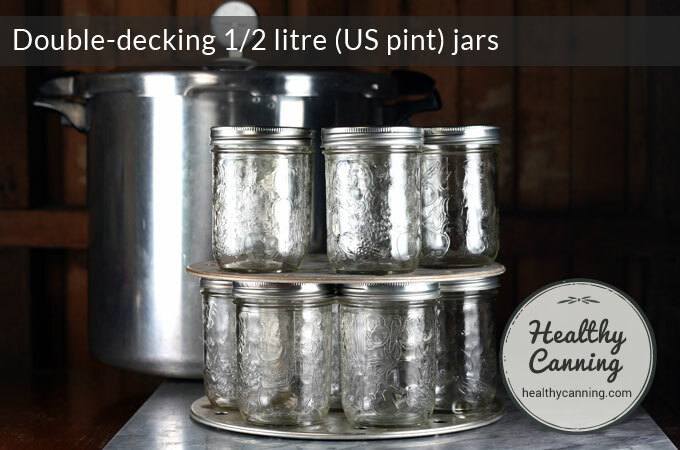 You will only get 9 Bernardin or Golden Harvest 1/2 litre (‘metric pint’) jars per layer. 8 around on the outside, and 1 in the middle. Current model Presto pressure canners have three lines engraved on the inside of them. 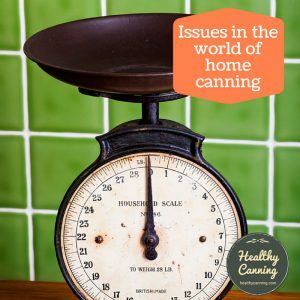 The lowest line concerns when you are using the pot as a pressure canner. 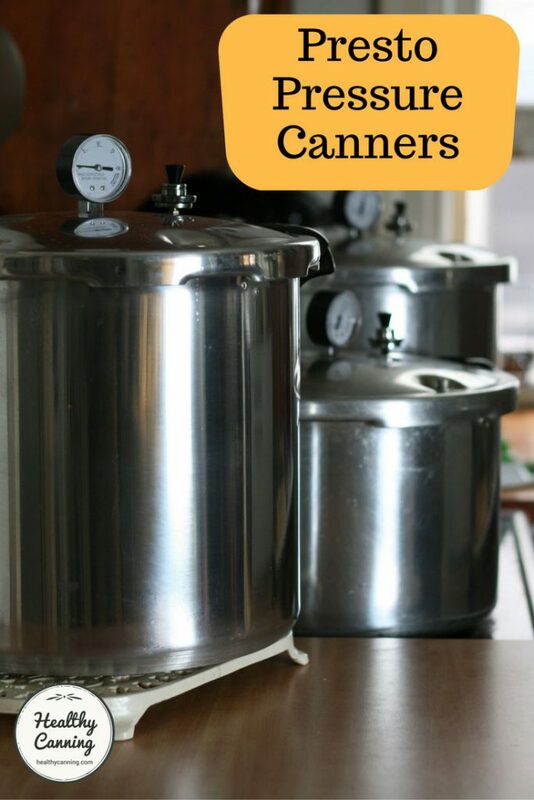 The top two lines have nothing to do with canning (whether pressure or water-bathing); they are for when you are using the pot as a pressure cooker. Some people say that despite the line, they still prefer to measure out the 3 litres / quarts using a measuring jug, as the fill line gets hard to see after the pot has been used a fair bit. You can call Presto for parts, use their Presto parts locator (choose “canners” from the list), or look on Amazon for the free shipping. 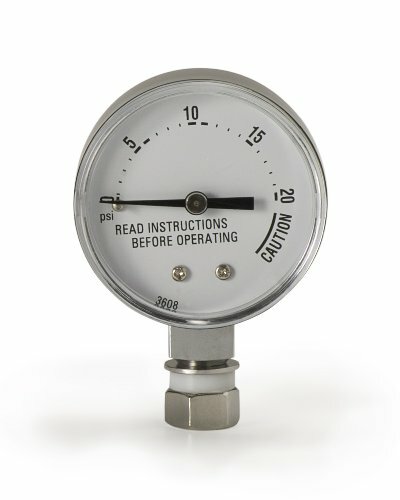 Replacement gauges are also very inexpensive. The Presto part number is 85772. It fits these models: 01/CG22, 175001, 175005, 175006, 01751 (18 quart dial gauge), 01755, 01755 (16 quart, dial gauge), 178001, 178005, 178006, 01781 (23 quart dial gauge). 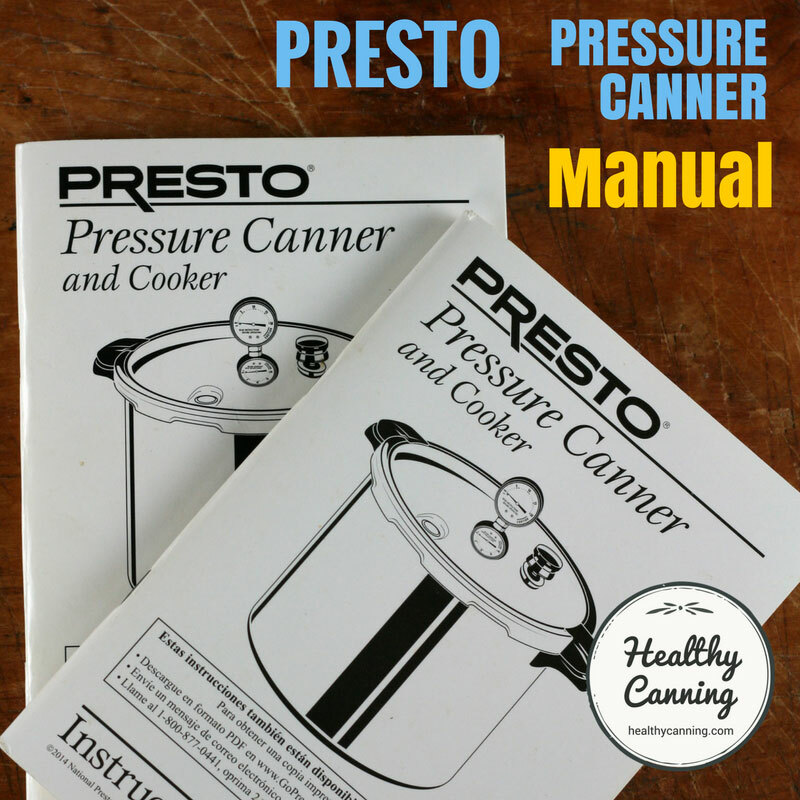 Presto’s pressure canner manual is considered to contain reliable home canning advice; see here. The Presto Company started in 1905 in Eau Claire, Wisconsin, under the name of Northwestern Steel and Iron Works. It made very large 50 US gallon capacity pressure canning machines for commercial canneries. Later on, it began making smaller 30 gallon ones for hotels, and then later, 10 gallon sizes for home use. By 1915, home sales were good enough to justify the company setting up an aluminum foundry dedicated to the home-sales business. In 1939, they introduced the name “Presto” for their first saucepan-style pressure cooker. 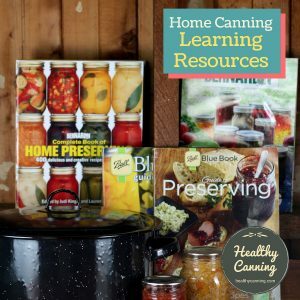 During the Second World War, almost all of their production facilities were converted to producing war materiel, with only a small number of canners made for and distributed through the government victory garden and home canning programs. 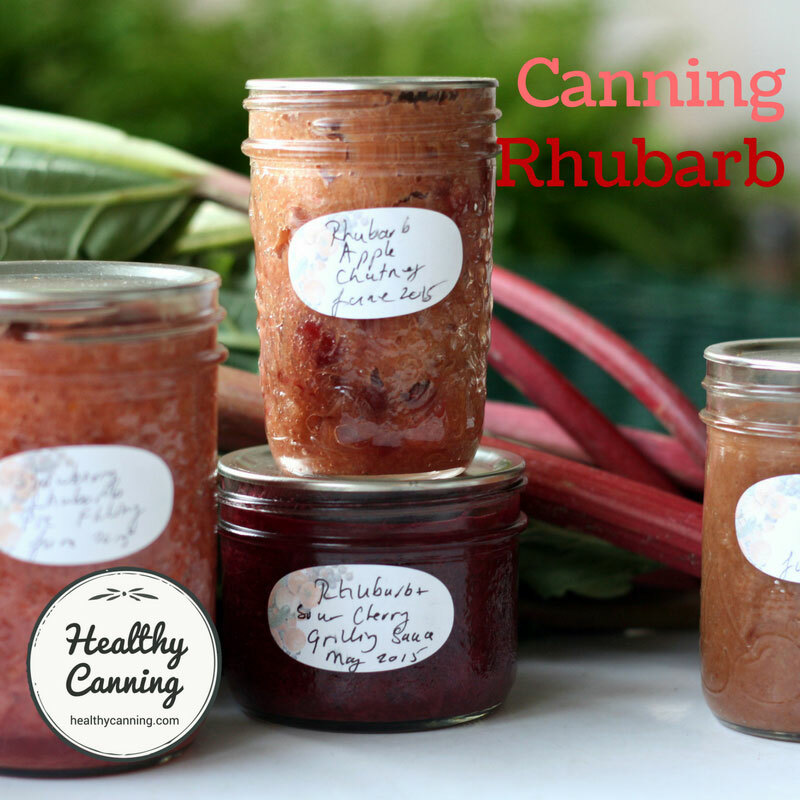 In 1945, the company introduced their 16 quart canner for the home. In 1953 the company name was changed to “National Presto Industries, Inc.”  Presto Company History. Accessed March 2015 at https://www.gopresto.com/information/history.php . 2. 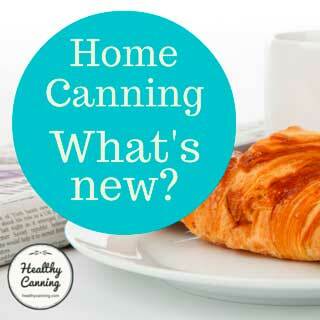 ↑ Prest0 23 Quart canner manual. Page 5. 4. ↑ Linda Ziedrich re discussion with Utah State Extension. Email on file. 20 May 2016. 6. ↑ Presto Company History. Accessed March 2015 at https://www.gopresto.com/information/history.php . Oh and where did you find the information about Presto approving the use of its canners on glass stove tops? I have some of my customers who’s Presto refused to honor the waranty on broken canners because they were used on glass stove tops. Thank you! Oh wow, finaly an answer to that 1/2 line, even at Presto the person on the phone could not answer that question! Please note that the French version of the owner’s manual has not been revised since 1980 and the infomations in it are not up to date. Actually, I got this information from the customer service manager at Presto that it has not been revised since 1980. Some sentences are a bit hard to understand for french speakers. I get a lot of questions about it from my clients. And like you mentionned in your text, the “pint” is definitly a problem. They should include metric mesurement for us canadians. Agreed about the metric. The person you spoke to is misinformed about the French manual. I’m not surprised. The date is right on it, and the directions in it are definitely post 1988. One example is “Pour les chopines, utilisez 1 c. à table de jus de citron en bouteille ou ¼ c. à thé d’acide citrique.” Those are USDA directions and the USDA did not mandate that until 1988. All the other directions are also USDA Complete Guide directions. The USDA Complete Guide did not exist until late in 1988, quickly revised again in 1989. 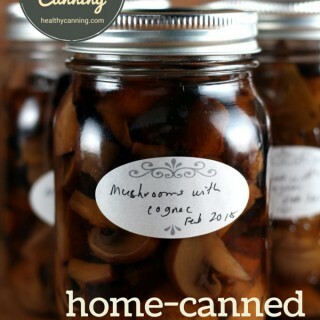 Iwant to try double stack canning quart jars. 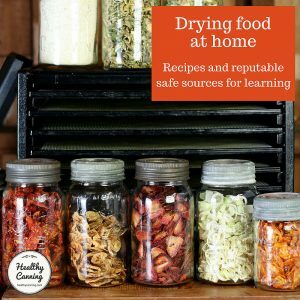 Do I cover top layer of jars with water ? 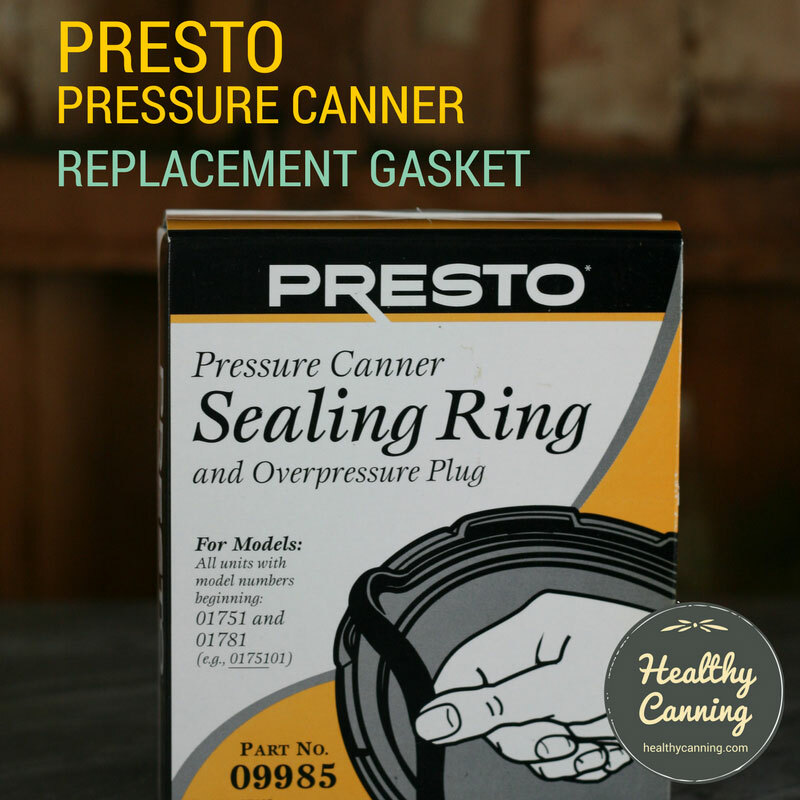 I use a presto pressure canner. Or do I just put so much in the bottom of canner ? 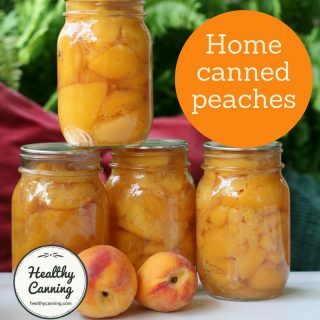 No Presto canner is tall enough to allow stacking of quart jars, whether you are water-bath canning or pressure canning. 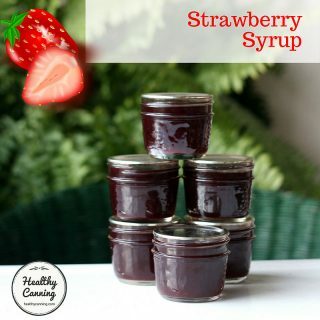 You will get a single layer of 7 jars, at a time. While I came to this website for the answer to a question that still remains unanswered, I am really glad I did find you. What wonderful information you have available here. I’ll be bookmarking, sharing and referencing this site a lot I can tell. Thank you so very much!! Can I dbl stack in the 16 qt canner? Can this product be used on a propane stove top? I’m going to suggest that you contact Presto directly, and when you do, provide full details of what your propane stove top is, to save time. Their customer service is excellent and really knowledgeable. there is a minimum water level line on the inside wall of the canner near the bottom, cut right into the canner. there is also a maximum ( HIGH WATER) water level line 2/3 rds of the way up the inside wall of the canner, cut right into the canner. if I had to pick which level to operate the canner, I would fill it to the 2/3 level, since I don’t want to run out of water ! KaBoom ! 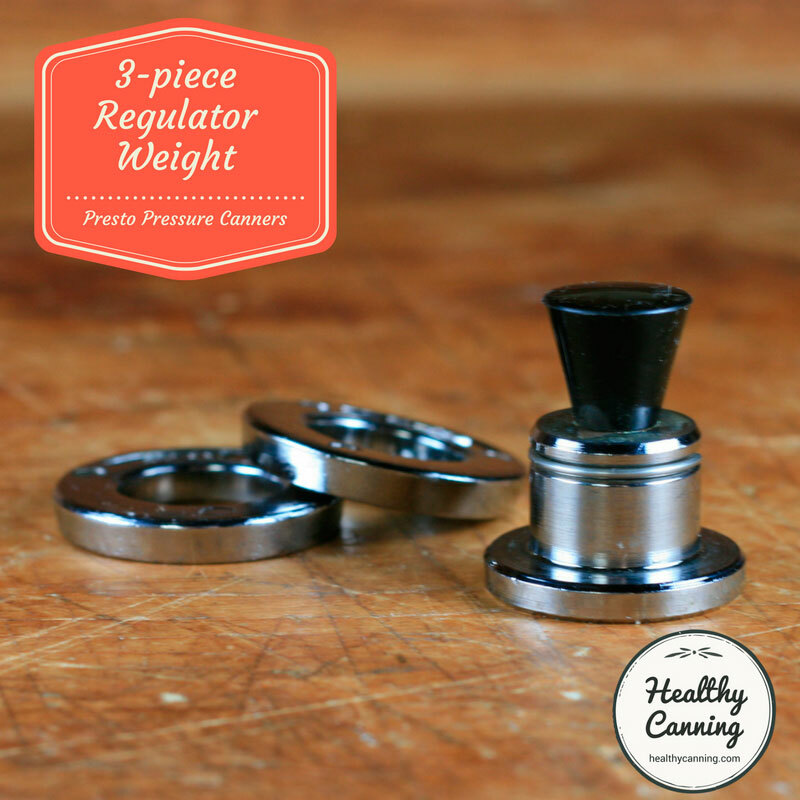 Hi Todd, the lowest line near the bottom is for pressure canning. 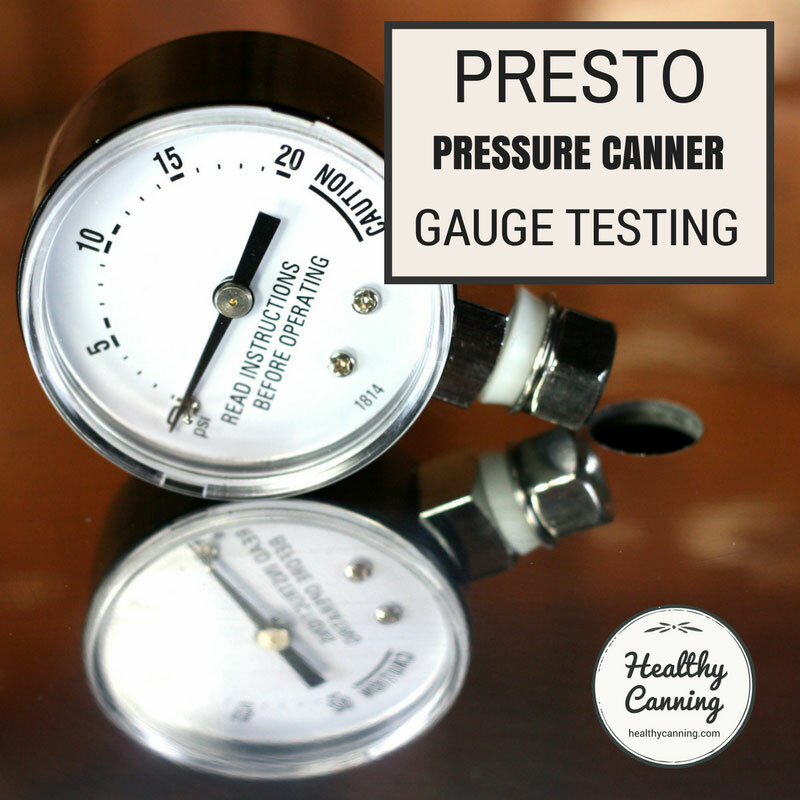 It indicates the 3 litres / quarts that Presto advises you put into the canner, when you are doing pressure canning. The other two lines are for when you are using it as a pressure cooker. They are max fill lines for food when you are pressure cooking. 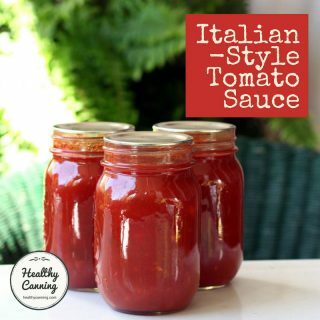 They don’t have to do with canning, whether water-bathing or pressure canning. See the “Important Safety Information” section of the manual. 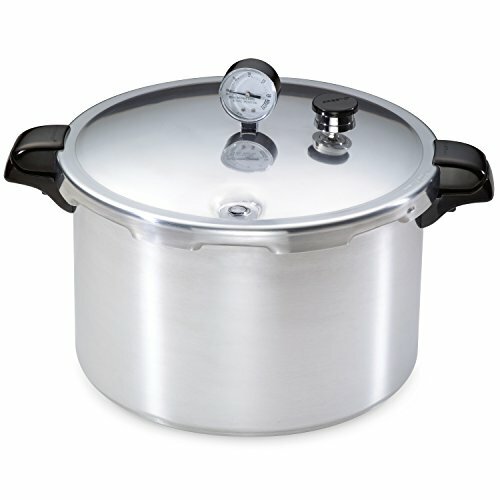 People often forget that these pots make great pressure cookers as well! Thanks for raising the topic of the lines. We’ve now added a section to clarify what they are for. Cheers!